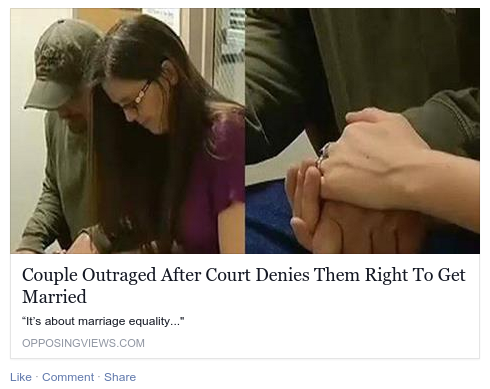 Note the clickbait caption... oh, this poor, poor young couple... their heads held low in shame... beat down by "da Man"... so oppressed, so downtrodden. No first wife in sight in the picture. Oh, and of course we're told of their "outrage", because we live in a society where children are trained that throwing a tantrum will get you whatever you want. What the story doesn't mention, of course, is that the aforementioned first wife is as equally protected by marriage laws prohibiting bigamy as anyone. Thus it IS about "marriage equality", and how these folks are wanting to avoid it. “It's two distinct marriages, it's two distinct unions..."
They're not arguing for a multiple marriage, but for multiple marriages. And since this is presented as a "distinct union", the rights of the first wife are not under consideration. And thus Nathan Collier and his mistress Christine lose before they start. The courthouse officials were completely right to reject the application outright, and they should have stuck to their guns. The Attorney General's office should reply likewise. Let them take it to court if they want. That won't make it past the court... not even this court, because what they want is the plain language description of bigamy. Bigamy laws are applied to everyone equally, and aren't affected in the slightest by the recent SCOTUS decision. If two people get married and one of the people marries a third person without divorcing the first one, then guess what...? Bigamist. It doesn't matter whether they're male, female, trans, partial, or whatever might be dreamed up. These people want exemption from that, and that's not equality; it's special treatment. Now, all that said... IF they had argued that they were all joining the same marriage, and the new spouse would be spouse to all existing partners, then we'd be having a completely different discussion. Then we'd be talking about a different kind of marriage... a single marriage of multiple partners, all of whom freely consented. In such a case, bigamy would still be illegal if one of the partners were to enter another marriage outside of his or her current one. And though it might lead to the same result (as it has in every single Western country), the discussion would be far more intellectually stimulating. 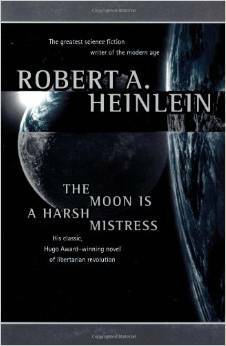 Heinlein discussed such things in some detail in his novel The Moon Is A Harsh Mistress. One arrangement that he described is a "line marriage", which is basically unending, surviving any individual partner. Likewise, they could have argued that the government has no compelling interest in limiting a couple to a single marriage. That would have had a harder time, I think, since the government will readily counter with the numerous reasons why the laws against bigamy were passed in the first place. The couple would have to show that these interests are now moot, separately from the SCOTUS ruling. Such arguments would require quite a bit of discussion in court. And, it's even money whether such a thing would get past the SCOTUS. With this court, I honestly could not bet one way or the other. But that's not the argument this group makes. Instead, by phrasing it in terms of "equality" when it's not, they chose a stupid one that fails with an effortless rebuttal.